Showing results for tags 'antman'. Hi I'm collecting ideas for antman photographs, just for fun actually. Do post your pictures of antman here and enjoy the discussions of ideas here! Here are some examples. Have fun! REVIEW: Short comparison of various sized Antman. As we know, the pym particles can actually shrink or enlarge the suit wearer. In this case, the LEGO Antman! 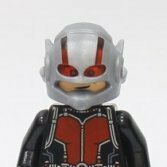 Lets go for the normal minifigure sized antman first. The translucent helmets allowed us to look into their eyes if you zoomed closer. The yellow jacket's helmet is so amazing! The back of their helmets are of lesser details but the back torso printing was so nice! You can see Darren Cross' backpack which made Scott went into the Quantum Realm. Lets loose the helmets. Scott's face is a unique expression, Hank's looked like they re-use Saruman's face. Antman and Dr. Pym had alternate faces. The 'O' shaped mouth of Scott might mean the expression he had when he first got his suit in the bathtub, haha.. 'I will disintegrate you!' Darren's jacket was so heavy where I need to place a skull under the backpack to make him stand. Now Hank turned into an old motorcycle suit, (so is it what the black head is for?) Hmm.. Feel the AWESOMENESS yet? The satisfying feeling of a collector completing the collection. The brick built Giantman and the nanofig was from the airport battle set 76051. Do you notice the blue button on the belt? I wonder why is it red on the minifigure. Whats up man.. Now the hulk is small.. The poseability of the giantman was quite similar to normal minifigures. The only downside of the nanofig was the inability to pose.. Hello Dr. Cross. Nearly forgot that he is actually bald where he doesn't need any hairpiece. Conclusion The collection of ant man was so awesome that you can't miss other two character as well. The three minifigures are exclusive and well designed. I would say LEGO did a good job designing them different from conventional minifigures. Have a nice day. Hope you liked my post. Do comment your feelings if you are an Antman fan! Thank you!